lucky me, my support person, BFF from 20 years back, Sue, has arrived in Ohio to be the back-up backbone of the family while I enter phase four of the cancerland ride. 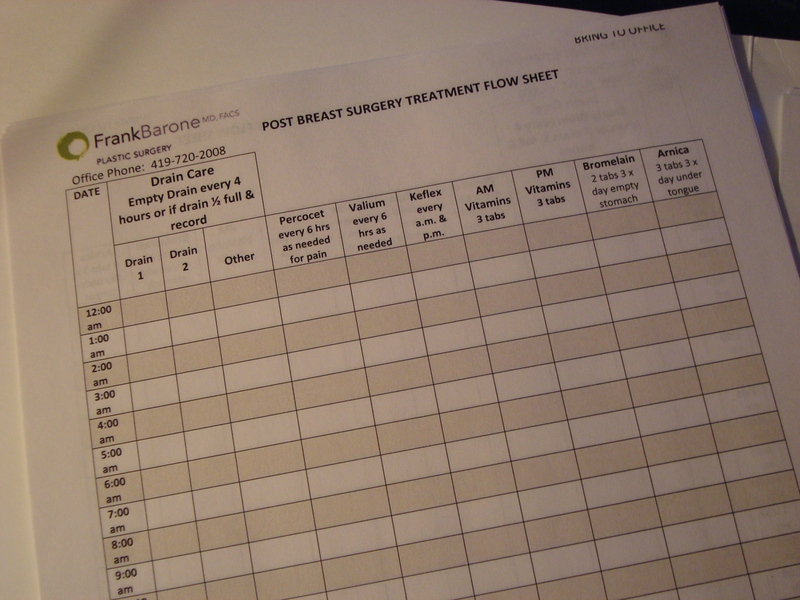 In three days I will have the first of three surgeries (the “delay procedure”) for the breast reconstruction process. Tomorrow morning I have an appointment at St. Vincents Hosptial for a pre-surgery exchange of information and body fluids. Eyes wide open, I am anxious, in a good kind of way, for this process to begin. Once it begins, it is then just a matter of time and experiences before it will be done. and over. I feel no fear at all, so please don’t be afraid for me. It’s just not necessary. I have 14 days worth of “drain tube” records documents at my bedside. Filled my prescriptions for pain medications, an antibiotic, and post surgery vitamins. The days I have been waiting for are finally drawing near, and I am slightly unsettled, and getting anxious to be moving forward. For the last couple of weeks in addition to being tired, everything also aches. These aches seem to come from deep within my bones. Side effect of Arimidex? maybe Zometa? I think both are possible and neither can be positively confirmed. Every day I compel my body to get up and move. I just put one foot in front of the other and then repeat. If I keep doing that eventually I’ll feel like moving. Some days that trick works and other days, well, I just keep putting one foot in front of the other. things are beginning to pick up around here. 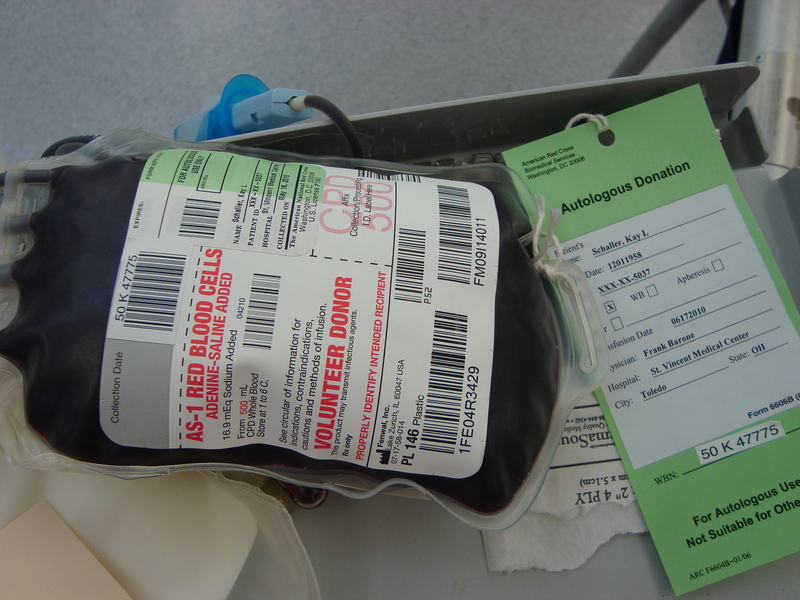 Nothing says “it’s time for surgery” quite like an autologous blood donation. So yesterday I went to the Red Cross and stuck out my arm so I could bank a bag of blood. With any luck, it will have been a needless precaution, and Dr. B won’t have to use it during my “big deal” surgery on June 17th. I haven’t posted much as I have been dog tired after days that begin at 5 am and end at 10 pm or later. School is almost out, and that means lots of extra work from grading to packing up two classrooms, final reports etc. In addition, trying to get ready for two surgeries, plus be a mom, and try to pick up the slack at home since Lou has been disabled by knee surgery. It has been an intense month in all spectrums of life. But I’ll keep you posted on all the highpoints right here. It’s pretty bad when you can’t wait for Monday morning because once you get to work, all you are expected to do is your job. Just one job. It’s not even 9 pm and I am completely spent. Not an ounce of energy left. Poor husband is still in bad shape from “minor” knee surgery nearly 3 weeks ago, and I really do feel bad for him, but it is difficult for me to pick up even a fraction of the work he usually does along with my work too. Workin’ my fingers to the bone and all that. Now I have a slowly swelling left wrist, and I greatly fear lymphoma is creeping up on me, and I am scared again. You are currently browsing the Kaylynne50's Blog blog archives for May, 2010.